A spring company which manufactures helical coil compression springs to fulfill the requirements of the spring operated mechanism they will be installed into. Acxess Spring Company manufactures custom compression springs amongst other types of springs like extension springs, torsion springs, etc. Whether they are simple coil compression springs or if perhaps they have some more complex modifications, Acxess Spring can make them all as long as they are made from round metal wire. These complex modifications may be either variable outer diameter size or variable pitch. Variable outer diameter size makes the shape of conical, concave, or convex compression springs. Concave and convex compression springs are also known as barrel springs. Variable pitch simply means that the coils are closer to each other on a certain section of the springs while they are further apart on a different section. The most innovative compression spring design tool, Spring Creator, is provided to you by Acxess Spring. 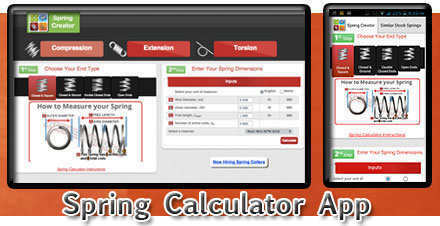 Spring creator is an online compression spring calculator which is able to calculate all of the important specs your design may need as well as provide you with live blueprints of your coil spring design. You will be able to calculate spring rate, maximum load, and maximum travel. There are also other important fields which will help Acxess Spring, compression springs manufacturer, produce your coil springs. One of the fields is Spring Index. By knowing your spring’s index, we’ll be able to know how complex your design will be to manufacture. Another important field includes the weight and wire length of your coil spring. These are useful to know how much material is needed in order to complete the job. Carry this advanced compression spring design tool on the go by downloading the app on either your Android or iOS mobile device. Acxess Spring, compression spring manufacturers, has taken their spring company another step by uploading a stock spring online store on the web. The Spring Store offers over 17,000 stock compression springs. Each one of these springs will be searched through by Spring Creator as you’re working on your design to see if we happen to have any similar springs in stock. You may also enter directly into The Spring Store and use our Compression Spring Finder to search through our catalog under your own tolerances. The dimensions you may search by are outer diameter, free length, rate, load, deflection (distance traveled), total coils, solid height, inner diameter, wire diameter, and material type. You will have the option to enter these either in the english (pounds and inches) or the metric (newtons and millimeters) units of measurement.